I am pretty sure I have indicated in a previous post that I absolutely love Halloween. There are really two reasons why I love it. The first is I love having an excuse to wear a costume. The second is that Halloween parties typically fall around my birthday, so it is great to be able to convince (or guilt) all of your friends to get into the spirit and dress up with you. I am always impressed by the people that think of their costumes well in advance. As much as I love costumes, I am not that much of a planner and I typically wait until the week before to figure out what I am going to be. I also love to make all of my costumes from scratch and take much pride in doing so. Previously I have been She-Ra, a Paper Doll, and this year, a cupcake! Here are some picture instructions I made to help anyone wanting to make a cupcake costume (y’know, if you are curious!). This year I was not alone in my crafty Halloween ways, but actually had an entire posse of cupcakes with me – pretty scary I know! But seriously, all of us on the dance floor at Lee’s Palace was quite the scene. We kind of went against Halloween norms of wearing something skimpy and tight, and went all out and well, BIG! It was actually nice not having anyone in your personal space at a bar as you kind of had this protective barrier around you. Anyway, I think the pics will speak for themselves as to how cute we all looked that night! So have you ever wondered what you can do with your beautifully carved pumpkin after Halloween? Especially if you have taken lots of time to make a really intricate design and still want to show it off? Well look no further – you can bring your pumpkin to a Pumpkin Parade! Many parks across the city are now hosting pumpkin parades the day after Halloween (November 1st if you needed me to be more specific). It is pretty much a way for people in the community to showcase their wonderful works of art with hundreds of others in a little exhibition of sorts. 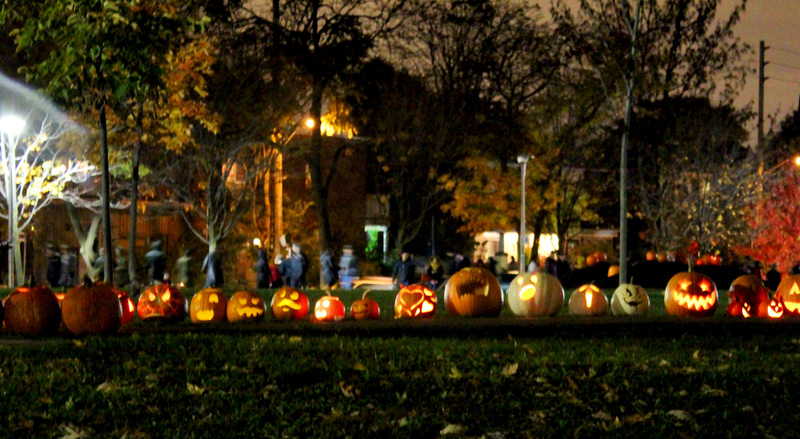 It is quite the spectacle to see almost 2,000 pumpkins lit up in a dark park. People also create the most amazing designs. 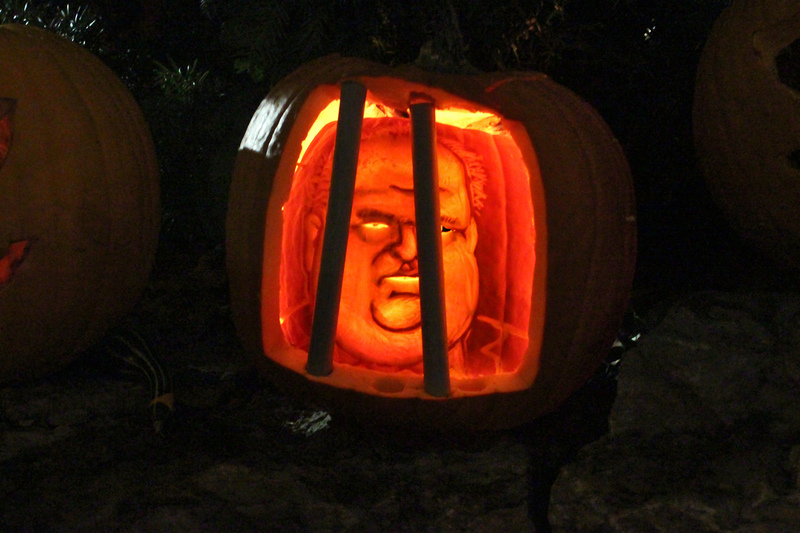 I think the big highlight this year was the Rob Ford in prison pumpkin. It definitely drew in quite the crowd. Check out my pics below for some of the highlights! Who knew that Spring smells like fundraising? I guess it kind of makes sense though. It’s a great time to shed those winter layers and celebrate the arrival of warmer weather by getting all dressed up while supporting some great Toronto organizations. Two weeks ago I attended the annual fundraising PROM at the ROM event. This past week I attended the AGO’s Massive Party. After going to the PROM, I wasn’t quite sure how the AGO’s event was going to stack up. I had attended previous fundraising events at the AGO (some better than others), and was a little skeptical how this year’s event was going to play out (SPOILER ALERT: It was pretty awesome). The theme for this year’s Massive Party was GOLD. The golden theme was infused throughout various installations in the gallery, as well as in people’s attire for the evening (check out the gold beauties in the pic below). Some installations included live performances such as an interpretive dance piece we caught on our way in. I am not really sure how this piece had anything to do with the GOLD theme, but I am sure there was a story somewhere…I just didn’t get it. Once we made it inside (and got our first round of drinks), we noticed a very colourful photo booth set up and just had to take a picture (really it was just me that wanted to take the picture…I love peer pressure!). While waiting in line for our pic to be taken, we noticed this rather interesting looking fellow (he kind of looked like the Mad Hatter) posing with everyone in their pics. We weren’t exactly sure what was going on – but were intrigued none the less. As we got closer to the booth, we noticed a large table filled with candies and Wonka bars and soon discovered that this was a Willy Wonka inspired photo shoot. It was a pretty cute way to tie in the golden theme by having a golden ticket inspired photo opp. After wandering around the gallery for a bit to check out some of the installations, we headed upstairs to hear the live band featuring Maylee Todd (and never made it back down until the lights came on at the end of the evening). It would have been interesting to see what was happening on the different levels though (I heard that there were some hurdle races going on with various obstacles as an installation), but we were having too much fun dancing the night away we didn’t want to leave. Plus we were served some delicious mini-grilled cheese (and who wants to leave a party where they serve mini-grilled cheese? Not me!). By the end of the evening, I was pretty happy with my decision to give the Massive Party another go-around this year. While I can’t say I feel particularly cultured for attending the event (it was more of a party than an evening of appreciating art), I had a great night hanging with my friends and enjoying the fantastic atmosphere created by the golden theme in such a beautiful building. If there was a battle between the PROM and GOLD – I think GOLD would have taken it. This past weekend I had the pleasure of attending the Ancient Prom at the ROM fundraising event. When I first heard about the event a couple of months ago, I was super curious to check it out and see how the ROM does PROM. I love attending fundraising events…especially the ones with a theme. I also love to get all doll’d up in a pretty dress as I don’t always have occasions to showcase my more ‘formal’ collection. However, if I had more time to prep, I think I totally would have gone in costume (FYI…I love to wear costumes). I guess I will just have to wait for Halloween to come ’round to bust out my next masterpiece. For those of you not really sure what this whole ROM PROM madness is all about – it is pretty much a fundraising event hosted by the Young Patrons Circle (YPC) to help support the ROM’s exhibits, galleries and programs. By purchasing a ticket to the event, you help support the ROM and get to party at the same time. It’s a win-win situation! Plus there was entertainment, an open bar, and a food station (to ensure you don’t get completely hammered from the casualties of the open bar). So let’s talk about this so-called ‘entertainment’ that I just mentioned above (seriously..I don’t think I need to go into too many details about the booze and food…but I did appreciate there being food stations set up instead of having to always be on the lookout to find those 1 or 2 waiters with the mini grilled cheese. Mmm…I digress). So I am not sure what getting your nails painted or putting on fake eye lashes has to do with the theme of ancient civilizations, but it somehow worked. Lots of girls were eager to get their nails and lashes all fancy and I am sure it definitely helped relieve some of the stress of standing in high heels for 4 hours. However, if you weren’t inclined to get your nails and eyelashes all done up (I don’t think I saw any men in line for those free services..but hey, it was open bar…we know where they were at), there was still fun to be had. There was a fortune teller on-site – complete with tarot cards and crystal ball. And randomly in the middle of the evening, a troop of belly dancers appeared to put on a great show and get their dance on with fellow party-goers. All-in-all, I think the ROM PROM was a very well run event (look at the smiles on our faces above…or could that just be the alcohol?). Everyone seemed to have a great time (you can’t really have a bad time when you are well fed and liquored up) and stayed until we were kicked out. It will be interesting to see how the AGO’s Massive Party next week will compare to the PROM. More to come on that in a future post!